David I. Thal, Director of Vitale Scientific Associates, LLC, has been notified by the Institute of Food Technologists (IFT) that he has met all requirements and is now designated a Certified Food Scientist (CFS). The IFT notes that this credential is the only global certification for food science professionals. Unlike any other certifications, the CFS designation recognizes the applied scientific knowledge and skills of global food professionals and provides a universal way to identify, cultivate, and retain top talent. The certification helps ensure that food science and technology professionals are up to date on the latest developments in food science to address global food and consumer needs. This is especially important as the global food system evolves to address increasingly complex challenges. Mr. Thal is also recognized by the American Society for Quality as a Certified Quality Auditor. These certifications in combination with more than 25 years’ experience conducting and supervising quantitative laboratory science make him a valuable resource for ensuring your food testing program is scientifically sound, compliant, and effective. He can be contacted at dthal@envstd.com. Over the last decade, high-profile outbreaks of foodborne illness and data showing that such illnesses strike almost 20% of Americans each year have caused a widespread recognition that we need a new, modern food safety system. The FDA Food Safety Modernization Act (FSMA) was signed into law by President Obama on January 4, 2011 and it is the most sweeping legislation for regulating the food industry in over 70 years. It aims to ensure the US food supply is safe by shifting the focus of federal regulators to be proactive rather than reactive, from responding to outbreaks to preventing food safety problems before they occur. The requirements for preventive controls for food include current good manufacturing practice and hazard analysis and risk-based preventive controls, which would apply to many domestic and foreign firms that manufacture, process, pack, or hold food. These firms would be required to evaluate hazards, identify and implement preventive controls to address these hazards, verify that the preventive controls are adequate to control the hazards identified, take corrective action when needed, and maintain a written plan and documentation. It is clear that the need for high-quality scientific data collection and management will intensify as these evaluations and subsequent control policies are contemplated. Because the decision to release foods to the marketplace will be made on the basis of hazard identifications and controls, the need for data of known quality and statistical power is obvious. A data quality program to support these needs will include statistically-informed sampling design, coupled with more rigorous protocols and uncertainty analysis. Data validation and performance evaluation studies for contract and internal laboratories are important tools to gain control of the overall analytical process. The proposed rule also contains requirements relating to auditing and certification of food facilities and food under the program and for notifying the FDA of conditions in an audited facility that could cause or contribute to a serious risk to the public health. To ensure the safety of food, the most effective preventative programs focus on quality assurance and quality control, which includes developing protocols of well documented and appropriate levels of accuracy, precision, sensitivity, and specificity. The proper implementation of quality programs must be assessed and this is typically performed through third-party audits. The combined requirements for monitoring, oversight, and notification are needed to give the FDA, consumers, and other stakeholders confidence in the program. If you have questions about how FSMA will impact your company, contact James Markwiese or David Thal at 865.376.7590. The House of Representatives passed a bill on January 29, 2014, authorizing nearly $1 trillion in spending on farm subsidies and nutrition programs, setting the stage for final passage of a new five-year farm bill that has been stalled for more than two years. Negotiators from the House and Senate spent several weeks working out their differences on issues in the legislation, including cuts to food stamps, income caps on farm subsidies and a price support program for dairy farmers. The bill is expected to save about $16.6 billion over the next 10 years. As noted in a recent Food Safety News article, the bill calls for scientific and economic analysis of the produce safety rule issued under the Food Safety Modernization Act (FSMA), along with a plan to systematically evaluate the impact of the final rule on farming and ranching operations and evaluate and respond to business concerns. This final version eliminated the House provision prohibiting enforcement of the regulation and now simply requires that an analysis of the information used in promulgating the rule be released alongside the final rule. The bill passed the House by a vote of 251 to 166. The Senate is expected to take up the bill later this week. The California law known as Proposition 65, formally titled “The Safe Drinking Water and Toxic Enforcement Act of 1986,” can accurately be thought of as “Omnibus Consumer Product Enforcement Act.” The law was enacted to improve public health by reducing exposure to toxic chemicals. More specifically, Proposition 65 controls a growing list of chemicals and substances believed to have the potential to cause cancer, birth defects, or other reproductive adverse effects. It is administered by the Office of Environmental Health Hazard Assessment, which is part of the California Environmental Protection Agency. Proposition 65 requires businesses to notify Californians about significant amounts of chemicals in the products they purchase, in their homes or workplaces, or that are released into the environment. These chemicals can include ingredients or additives in household or workplace products and foods, and can even include byproducts of chemical processes. Since it was first published in 1987, the list has grown to include approximately 800 chemicals. For carcinogens, the toxicity of a chemical is based on no more than one excess cancer risk in 100,000 individuals exposed to that concentration of the chemical over 70 years. For non-carcinogens, an additional 1000-fold margin of safety is applied to the more conventional benchmark for toxicity that is based on an exposure concentration shown to have no effect on humans or, more often, laboratory animals. Once a chemical is listed, businesses have a year to comply with listing requirements, including posting warnings about toxic chemicals associated with their operations. The warning requirement states that, “no person in the course of doing business shall knowingly and intentionally expose any individual to a chemical known to the state to cause cancer or reproductive toxicity without first giving clear and reasonable warning to such individual.” Suppliers of food, water, and other exposure media are required to show that a properly applied method of detection and analysis was followed, where “method of detection and analysis” means a specific analytical testing procedure appropriate for detecting a particular chemical in a particular matrix such as air, water, soil, or food that is applied for the purpose of detecting the chemical or measuring its concentration (Section 12900 ARTICLE 9. MISCELLANEOUS, 22 CCR 12900). This vague, circular language is an insufficient basis for identifying a concrete, technically valid testing regimen. The supplier will likely need assistance from specialists to address this requirement. Proposition 65 has established safety thresholds, also called safe harbor numbers, for some 300 listed chemicals based on conservative exposure assumptions, leaving about 500 chemicals currently without safe harbor numbers. If a chemical is not listed, companies using such chemicals have the onus of developing exposure information. Here again, the supplier will need assistance from specialists versed in the finer points of exposure assessment and analytical validity. Vitale Scientific Associates, LLC provides expertise in the evaluation of sampling and analytical methodology. 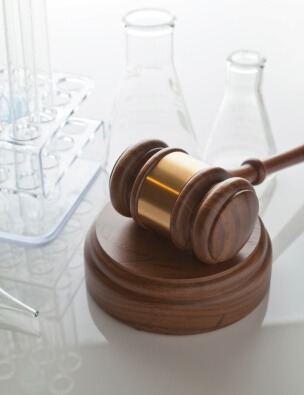 We have assisted in litigation and laboratory evaluation for Proposition 65 cases and stand ready to support our clients through this challenging process. A copy of the current Proposition 65 list can be found here. For more information, please contact Quality Assurance Specialist David Thal at dthal@vitalescientific.com. This article is the third in a series of three by Senior Scientist James Markwiese, Ph.D., discussing the quality control and quality assurance measures for state-of-the-practice toxicity testing. The series focuses on mechanisms to facilitate the establishment and documentation of quality procedures for toxicity testing laboratories. The first article in this series is available here. The second article in this series is available here. To date, we have considered consequences of mischaracterizing (over- or underestimating) the toxicity of a test material (foods, ingredients, raw materials finished products) and the role of laboratory audits in ensuring the quality of toxicity testing results. This final segment will highlight the strengths and weaknesses of toxicity testing to highlight what can be expected regarding the use of toxicity test results for decision making. Toxicity testing represents a powerful line of evidence for assessing impacts from trace-level chemical contaminants in the test material. Toxicity test results are more realistic than basing conclusions on literature values because they incorporate synergistic, antagonistic, and kinetic features of the particular medium. Additionally, toxicity testing can provide transparent scientific input to decision-makers regarding certainty (vs. uncertainty), importance, and significance of results. For example, literature-based estimates are typically based on exposures to single chemicals. But because contaminated media typically represents a mixture of chemicals, bioassays can integrate effects from multiple stressors using the specific test material being studied. Appropriate quality assurance and quality control can also be employed to reduce uncertainty and increase test acceptability. If you have questions about toxicity testing quality assurance, please contact James Markwiese, Ph.D. at 865.376.7590. This article is the second in a series of three by Senior Scientist James Markwiese, PhD, discussing the quality control and quality assurance measures for state-of-the-practice toxicity testing. The series focuses on mechanisms to facilitate the establishment and documentation of quality procedures for toxicity testing laboratories. The first article in this series is available here. The third article in this series is available here. A laboratory must actively ensure that its quality system is being properly implemented and that it is achieving the required standard of quality. Quality control measures, such as a method-specific demonstration of bioassay capability, can provide feedback on the quality system but are not enough to ensure quality results. Audits are designed to provide an objective and thorough evaluation of quality issues affecting a laboratory and cover the entirety of the quality system. Routine audits of toxicity testing laboratories can detect actual or potential non-conformances before they impact data quality and can even identify possible future problems. Where there are no problems, the audit provides a record that the quality assurance system has been thoroughly evaluated and found to be acceptable. and methodology including test implementation and performance. These topics can be covered in any order, but typically begin with an evaluation of documentation and records and end with method/ test performance review. The most important, and perhaps most difficult to gauge, aspect of the latter involves evaluating competence of laboratory personnel for routine maintenance, such as culture of test organisms. For confidence in bioassay results, it is imperative to demonstrate that the organism is responding to the test substance and/or conditions and not some confounding factor (lack of acclimation to test conditions, disease, etc.). Validity of results can be evaluated on a test-specific basis and efforts are underway to gauge long-term performance of testing laboratories. Although audits typically only last from one to several days, and therefore represent a narrow window for gauging year-round laboratory operations, they offer an unparalleled means for evaluating a laboratory’s implementation of its quality assurance system. Connect with Dr. Markwiese on LinkedIn or at jmarkwiese@vitalescientific.com. This is the first in a series of articles discussing the quality control and quality assurance measures for state-of-the-practice toxicity testing by Senior Scientist James Markwiese, PhD. The series will focus on mechanisms to facilitate the establishment and documentation of quality procedures for toxicity testing laboratories. The second article in this series is available here. The third article in this series is available here. Toxicity tests are used to determine whether materials containing multiple constituents can induce effects upon living organisms. The liability associated with inadequate characterization of toxicity (either over- or under-estimating actual toxicity) can be enormous and the quality of toxicity testing is, therefore, of great importance. While rigorous quality assurance evaluations such as data validation are routine for chemical characterization of samples, analogous toxicity testing quality assurance measures are limited; this lack of QA can present a vulnerability to our clients. Vitale Scientific Associates is taking the necessary steps to ensure that only high-quality and defensible toxicity data are provided. emphasis on analyst training (particularly with regard to culture and maintenance of test organisms). maintenance of standardized operating procedures. maintenance of required test conditions. use of standard reference toxicants. testing multiple control or reference samples with each batch of toxicity tests. © 2019 Vitale Scientific Associates, LLC. All Rights Reserved.